Many roles in a conversation are essential for shaping deep and meaningful insights. Beyond a person’s title, roles better define our individual contributions to the group. Aggregator. Responsible for capturing notes and takeaways, based on objectives established by the group. Analyst. A deep, logical thinker, a person who can take apart ideas to consider pros and cons, and who can assess the relevance of the topic at hand; they also help ensure that the topic being discussed isn’t rushed through or taken for granted. Catalyst. Generally starts a debate, a new discussion thread, or simply the next big idea; differentiated from designers by their motivation to get things going in a social sense; a leadership role. Challenger. Likes to look at alternative conclusions, especially those that arrive to the group prefabricated; helps ensure that resulting assumptions are valid; sometimes considered a naysayer or devil’s advocate; plays a valuable role by ensuring critical thinking. Connector. Good at making inferences, with a strong ability to draw together relationships among ideas that seem unrelated; excellent at identifying interesting synergies, similarities, or patterns across diverse contexts. Designer. Best identified by raw creative potential to come up with new ideas; also known for pattern matching, visualization, and a love for creating; often considered a “visionary” for their ability to see a future state that does not yet exist. Historian. Good command of already established knowledge, delivering insights during the conversation (real-time) or willing and able to research/reconcile material (offline) as needed; can also wear the badge of academic, researcher, or librarian. Moderator. Responsible for facilitating the session, guiding the content and flow of interaction, but actively listening to ideas, context shifts, and proposed outcomes; must effectively prioritize subsequent steps; a leadership role. Planner. Understands objectives and the collaboration process well; takes steps to ensure the necessary initial conditions and participants are in place; focuses on member recruitment and screening (if applicable); a leadership role. Practitioner. A person practicing, conducting, or otherwise carrying out the activities of a professional within a specific field; a critical but often overlooked participant! Referee. Monitors process guidelines and compliance, and insists on a clear, established approach; keeps the group on-track by periodically reminding the team of boundaries. Focused on schedule, to ensure time commitments are honored. SME (“Subject Matter Expert”). A recognized authority in a specific field, serving as a “go to” within the team for immediate feedback on knowledge, trends, or open topics for the field in question. For effective collaboration, SMEs should be open-minded; experts who are “dug in” and non-negotiable often struggle. Have you seen yourself and others play these roles in practice? Have you worn more than one hat, even in the same conversation? Which roles resonate the most for you? To me, these are important questions. They help us shape the dialog that results in new thinking, which opens pathways for change. Perhaps most important, this thinking may further spark our personal contributions. In the book, I discuss these roles as they impact collaboration, and how they apply within the working dynamics of a team. We also discuss these and related topics monthly on Twitter, at hashtag #orgdna, as we unpack the #futureofwork. Simply use a Twitter streaming app like TweetDeck using these hashtags in your tweets. We meet most 3rd Mondays from 9-11 p.m. ET. Organizations are changing, and it’s sparking a lively conversation. I hope you’ll join us. 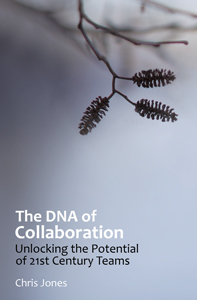 Book content on this page is from The DNA of Collaboration (c) 2012, re-posted here courtesy Amberwood Media Group.